The meaning of your life is not beyond your grasp. Life is trying to tell you the meaning. You just need to know how to de-code its secret message. In his powerful audio album, The Meaning of Life, Guy Finley tackles the big questions, and delivers the answers that show you how to understand and fulfill the true purpose of your life. This is an entire course in self-realization that can guide you to the insights and discoveries that will actually change you. 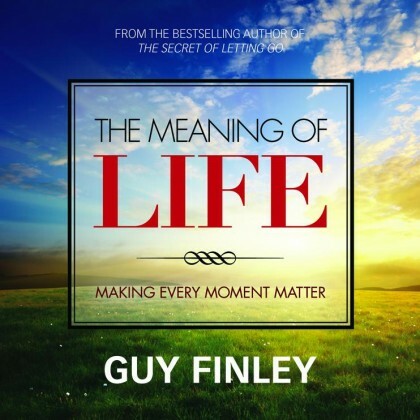 Find the Meaning of Life in Every Moment: Discover the secret message life is waiting to give you. The Secret of Changing Your Life Story: How to break free of painful patterns and enter a new chapter of your life. Leave The Problems of Your Past Behind You: Uncover, and dismiss, the real cause of every problem you have. The Golden Rule of Self-Realization: Understand and change the workings of your mind for a trouble-free tomorrow. Shatter the Source of All Unseen Self-Limitation: Find the cause of disturbance in your own unconscious nature and experience true freedom. Welcome the Healing Light of Self-Honesty: Learn how to give your whole heart to the process of self-liberation. Being at Peace With Yourself Begins Here: Find the inner strength to meet -- and transform -- any moment. Start Letting Stillness Organize Your Life: Using meditation to enter new realms of your own being. Perhaps you have had certain questions your entire life. You sense that if you had the answers, you would meet events differently, would have better relationships, and would know how to make the most of every moment. Your sensing is right -- and now you can have those answers. They are available in The Meaning of Life. Discover the secret message life is waiting to give you. How to break free of painful patterns and enter a new chapter of your life. Uncover, and dismiss, the real cause of every problem you have. Understand and change the workings of your mind for a trouble-free tomorrow. Find the cause of disturbance in your own unconscious nature and experience true freedom. Learn how to give your whole heart to the process of self-liberation. Find the inner strength to meet -- and transform -- any moment. Using meditation to enter new realms of your own being.